The Smithsonian knows how to take a joke, or at least it’s learning. When Comedy Central’s Stephen Colbert lobbied on-air for his portrait to be included among the national treasures at the National Museum of American History, the museum’s director Brent Glass played straight man. But the National Portrait Gallery’s former director Marc Pachter, who was the second to hear Colbert’s plea, deserves some props. He played hacky sack with Colbert in a tight gallery space and temporarily hung his portrait in the entryway to the bathrooms just outside the hall of America’s Presidents. Glass redeemed himself when he reconsidered, as well. 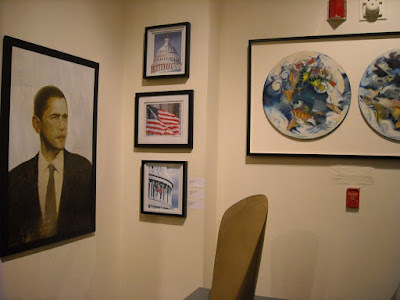 The portrait now hangs in the American History museum, next to Dumbo the flying elephant. Word on the street is that Colbert is pitting his portrait against Fairey’s Obama in a face off. He has asked the National Portrait Gallery to calculate whether Fairey’s is more popular than his, based on visitation numbers. The DC Commission on the Arts and Humanities is conducting a city-wide Public Art Master Plan. They invite you to an Open House to participate and share your thoughts on Public Art in your neighborhood, which will be included in the overall DC Creates Public Art Program Vision in the District of Columbia. The DC Creates Public Art Program will preserve the cultural health, reflect the diverse fabric and promote creative innovation in Washington, DC by reinforcing urban places that become the heart of every community. In Unknowns John Kirchner converses with unknown 19th century painters. Kirchner augments damaged vintage portraits, landscapes and history paintings with articles of clothing and other common objects. The artist's interventions with the works of his anonymous predecessors are thoughtful, critical and sometimes humorous. Brandon Morse examines factors of overreach, neglect and collapse with a series of video projections in This Shape We're In. Using digital media, the artist created images of architectonic structures. Morse's complex forms analogize cultural systems which strive to maintain their integrity as destructive external forces intensify. Seeming to toil as protagonists in universal struggles, the artist's vulnerable linear structures have the power to elicit our empathy, though they ultimately lack the strength to preserve their own constitutions. Ivonne Thein has created 14 large-format photographs of alarmingly stick-like, elegant young women in scant, silvery clothing, their faces obscured by well-tended hair, assuming near-contortionist mock-fashion poses on a floor. The artist's digital manipulation exaggerates the effect. FotoGalerie, the Goethe-Institut's newly-defined exhibition space, brings young German photography to the Washington arts scene. Anthony Pontius / Why on Earth? 2007, oil on panel, 30"x36"
This Saturday, January 31, 6pm Join WPA for the opening of several shows at the American University Museum, including works featured in this year's auction. Curator talks and presentation of the Alice Denny Award for Support of Contemporary Art. 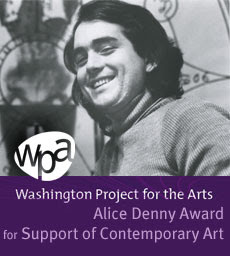 This show features work by local contemporary artists and members of the Washington Project for the Arts (WPA). WPA invites contemporary art aficionados to indulge their passion for art at the 28th Annual Art Auction Gala to be held on Saturday, March 7, at 6 p.m. 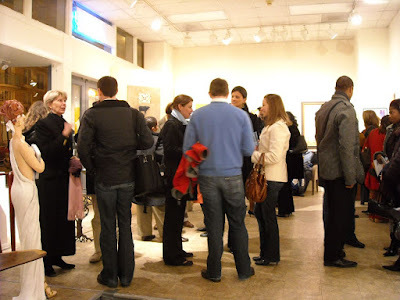 This noted event has grown in recognition and reputation as Washington's premiere contemporary art event for not only art collectors but also business, social, and art leaders in the community. All proceeds benefit the programs and exhibitions of the WPA. For tickets and more information, please visit auction. wpadc.org. Shannon Cannings’ oil paintings are fun, colorful, vibrant depictions of plastic toy guns. Jessica Dunegan pours layer upon layer of paint into clear epoxy resin, creating hauntingly beautiful images of chandeliers. 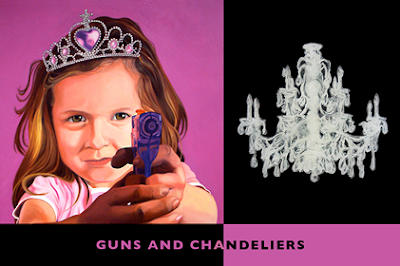 Guns and Chandeliers… iconic and glorified commodities that make powerful statements yet carry very different associations. This exhibition is about how common objects are interpreted and what they symbolize. It is a show of obvious contrast and contradiction. PROSPECT 1 curator Dan Cameron has had to cancel his lecture for Thursday, February 5 at the Maryland Institute College of Art. Mr. Cameron was to be the inaugural speaker of the Contemporary Museum's New Art Dialogue Series. The Contemporary is working with Mr. Cameron to reschedule this lecture and will inform of the new date and time, and of future lectures hosted by the Contemporary Museum. 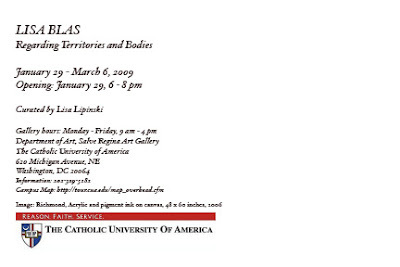 Catholic University presents the opening of “Regarding Territories and Bodies,” an exhibition of landscape and figurative paintings by Lisa Blas that recreates iconic Civil War sites, such as Gettysburg and Richmond, and historic figures John Wilkes Booth and Pauline Cushman, among others. Blas is a visual artist born and educated in Los Angeles, currently based in Washington, D.C. She has been a visiting artist at American University and Joppa Masonic Lodge in D.C. She is presently a member of both the senior core faculty at the Corcoran College of Art + Design and the drawing and painting faculty at George Washington University. Blas has participated in solo and group exhibitions in D.C., Berlin, Mexico City, Los Angeles and Barcelona, Spain. opening reception: Saturday, January 31, from 7 -9pm. 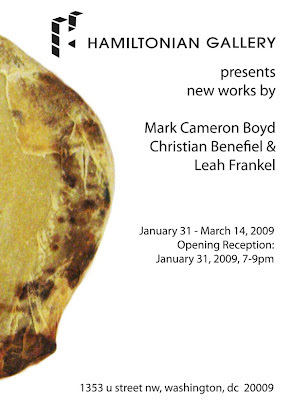 Hamiltonian Gallery and Hamiltonian Artists are proud to announce the opening of their fourth exhibition featuring the work of Mark Cameron Boyd, Christian Benefiel and Leah Frankel. Using archetypal objects, commonly used in their own practices, each artist manipulates, strips, cleaves, shrouds and sheathes their source material into new forms yet diametrically preserves its essence. Reception: January 30, 6 – 9 p.m.
Public/Private illustrates what contemporary art often does best: address everyday life as it is lived, and sharpen the viewer’s understanding of what it means to be human in the present tense. Ben Kinsley and Robin Hewlett created a public art project last year that now exists online: On the day when the Google Maps street view truck came to photograph their street in Pittsburgh, PA (in order to create a searchable 360 degree photo rendering of the street), the artists staged a number of mock events using residents of the neighborhood, including a marathon, a parade with a marching band, and combat with swords and laser beams. The resulting STREET WITH A VIEW project will be searchable in the gallery via live web terminal, and video showing the events being staged live will also be shown. Satomi Shirai is a young NYC photographer whose pictures are ostensibly about apartment living and asian-american culture clash. Though the apartment that serves as a backdrop is cluttered with junk, and the actions depicted are mundane--cooking, cleaning, exercising--like many contemporary women photographers, Shirai stages her images, featuring herself in poses awkward or balletic; each boxtop, magazine, or severed fish head appears to be a carefully placed prop. D.C. artist Matthew Sutton (represented locally by Conner Contemporary's *gogo art projects) presents a piece based on Febreze Scentstories, commercially available air fresheners that change their scents over time in order to create linear narratives through smell. Sutton invites viewers to sit in a booth and write creatively in response to sequences of scents--either by writing short stories, free association, verse, etc. Subsequent visitors can read the accumulated stories, which are pinned to the wall as the show's run continues. Richard Saxton is an artist, designer, and architect, designing and building functional public art projects--bus shelters, vehicles, music studios--that are intended for use by specific communities. 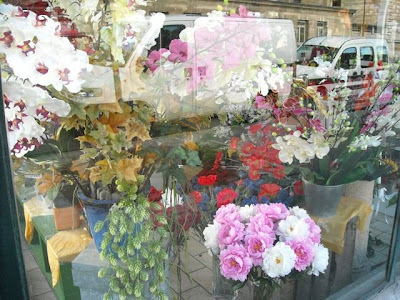 The AAC will be featuring prints of Saxton's collages, CAD drawings, and installation photographs for his 2006 M.I.K.E. project, which serves as a mobile sculpture, a public performance space, and a community-based music program all at once. Chris Barr and Veronique Cote are two Philadelphia artists who have created a web-based news broadcast in which the two artists, dressed as T.V. news anchors, and appearing in front of the sorts of backdrops favored by cable news channels, report on the activities of their family members and close friends, as gathered through e-mails, text messages, and phone conversations. Several episodes of this program--the EVERYONE THAT WE KNOW NEWS--will be playing at the AAC. Also featured: Installations by Lisa Blas, Anissa Mack, Mandy Burrow, and Stephanie Robbins, and video of a site specific, interactive kinetic sculpture by Christian Moeller. PUBLIC/PRIVATE is curated by AAC Director of Exhibitions Jeffry Cudlin. The Ellipse Arts Center is temporarily closed due to circumstances beyond their control. Updated information will be posted here as it is available. Presented by Washington Area Lawyers for the Arts, this workshop will cover the basic legalities of copyrights, trademarks and contracts for visual artists. John D. Mason is a Washington DC / Maryland based art and entertainment and intellectual property attorney. His practice focuses on copyright and trademark matters, litigation, contracts and commercial matters. He works with writers, artists and creative people and companies to protect and exploit their work and is also a literary agent. He sits on the Board of Directors of the Washington Lawyers for the Arts. The website for his new firm, The Intellectual Property Group, PLLC, is www.artlaws.com. The Contemporary Museum will introduce a new forum for discussion of contemporary art in Baltimore - New Art Dialogue Series - with a conversation with Dan Cameron, director and curator of the landmark PROSPECT 1 exhibition in New Orleans, on Thursday, February 5, 2009 at 7 p.m. The program will be held at Maryland Institute College of Art’s Falvey Hall. Mr. Cameron will share his experience curating PROSPECT 1 and the impact that it had on post-Katrina New Orleans. PROSPECT 1 was the largest international exhibition of contemporary art presented in the United States. The critically-acclaimed exhibition included works by 81 artists from 38 countries, presented in more than two dozen galleries and public spaces throughout the city. The 10 week exhibit closes in late January. Mr. Cameron is Visual Arts Director at the New Orleans Contemporary Arts Center; he previously served as Senior Curator at the New Museum in New York. Admission to the lecture is $10 for the general public, $5 for students, and free for members of the Contemporary Museum and MICA students. The Contemporary’s New Art Dialogue Series will present lectures and conversations by distinguished artists, critics, art historians, and curators whose work is defining the field of contemporary art. The series will cultivate critical discourse responsive to the cultural, social, and political issues of our time. The New Art Dialogue Series is sponsored by the Louise D. and Morton J. Macks Family Foundation. Additional support is provided by Bodil Ottesen. A number of artists have been asking about the current economic downturn. More than anything, they want to know what's going to happen to us creative spirits. While I'm no economist, there's evidence of a hard truth. Art follows money. (1) Maintain your prices--increasingly prove the investment value of your work and honour those customers who have invested in you in the past. (2) Continue to make first-rate work. In recessions, the bottom end can fall out completely. If anything, aim to improve quality and try to produce more important and challenging work. There will always be collectors of quality work. (3) If you can afford it, grab any opportunities to improve. Image Credit: John N. Robinson, Myself, n.d., oil on canvas mounted to paperboard, 17" x 13"
Opening Reception: Saturday, January 31, 6:30 – 8:30 p.m.
Bob Johnson, Chairman and Founder of The RLJ Companies will debut select works from his privately owned Barnett-Aden Collection (“the Collection”). Since the early 1980s, Johnson has assembled a private collection of more than 250 pieces of artwork by 19th- and 20th-Century African Americans, Africans and artists of other ethnicities. This exhibition, “Selections from the Barnett-Aden Collection: A Homecoming Celebration” is a preview of a variety of works featured in the Barnett-Aden Collection acquired by Johnson in 1998, and will be shown at Hemphill Fine Arts from January 31 through March 7, 2009. Tuesday - Saturday, 10 AM to 5 PM and by appointment. The The New York Times has an interesting article about the acquisition, by the National Portrait Gallery, of street artist Shepard Fairey's Obama portrait. Read The New York Times Article By Randy Kennedy HERE, Outlaws at the Art Museum (and Not for a Heist). Muralist, musician and art teacher, Pepe Piedra is creating a series of beautiful murals for the Sun Rise Academy. The murals provide students with a warm and educational environment which helps them better understand their lives through history. "This is my contribution to the community as a Immigrant Artist, helping young people understand the meaning of Immigration in these times of change and hope in this Country of Immigrant people," says Jose Piedra. Join McLean Project for the Arts on a private tour of the studios of artists David Carlson and Lynn Schmidt on Tuesday February 17. Following the tour, the artists will join the group for lunch at Restaurant Vero. $40 for McLean residents/ $50 for others includes cost of transportation and lunch. Meet at the McLean Community Center at 9:30 am and return at 2 pm. As time passes, we are graced with witnessing the creative wellsprings and outpourings of each other. I'd like to share this wonderful exhibition that I saw this spring at the Govinda Gallery. I videotaped the artist talking about her work and put it together in this short video. I hope you enjoy it. Carlotta Hester’s exhibition, Elemental Journey was first exhibited in Ireland at the Cavan County Museum and then in Havana, Cuba, at the Galería de La Biblioteca Rubén Martínez Villena. Elemental Journey was seen for the first time in the United States at Govinda Gallery in Washington, D.C. on April 18 - May 31, 2008. Elemental Journey featured a series of limited edition works on paper derived from a selection of pages from the artist’s sketchbooks. Sketchbooks are an integral part of Hester’s life, a portable home for memories, thoughts, and dreams. 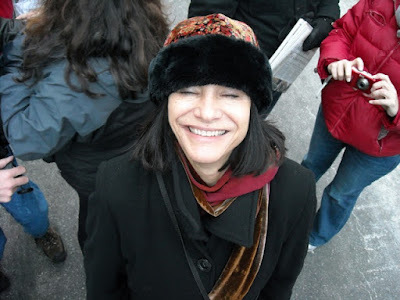 Insights and experiences gathered along her journeys through different spaces - whether they are the arts and cultures of other countries, the movements of everyday life, or the interior dimensions of the soul - are translated into Hester’s vocabulary of colors, text, and objects. 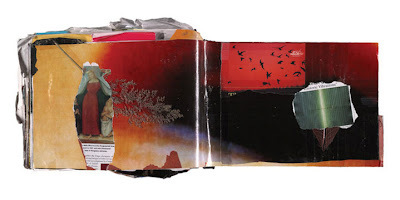 These “collected bits of life” are arranged into explorations of material, techniques, and ideas, all of which produce an imagery in her work that is rich with symbolism. Opening reception: Friday, January 30, 5-8 p.m.
Follies, Predicaments, and Other Conundrums: The Works of Laure Drogoul is the first large-scale retrospective of Rinehart School of Sculpture graduate Laure Drogoul '81. Drogoul, a Baltimore-based interdisciplinary artist, is best known for her participatory and sensorial works that are articulated through sculpture, installation, performance, and Web-based media. This exhibition was curated by Maryland Institute College of Art (MICA) Exhibitions Department Director Gerald Ross, and organized and produced in partnership with students in the Exhibition Development Seminar (EDS) under the guidance of course instructor Glenn Shrum '08. Follies, Predicaments, and Other Conundrums: The Works of Laure Drogoul and the exhibition's educational programs and catalogue were made possible through generous support from the Friends of the Exhibition Development Seminar. Local neon sculptor Craig Kraft is seen installing one of his neon sculptures in this video by Fletcher Prince. The DC Commission on the Arts and Humanities is proud to provide funding for teachers, schools & artists committed to bringing impactful art experiences into the classrooms of DC Public Schools & Public Charter Schools. ASSISTANCE IS AVAILABLE FOR PREPARATION OF THIS GRANT! Saturday, Jan. 24, 1 - 4 p.m.
CHINESE LUNAR NEW YEAR PARADE Sunday, Feb. 1, 2- 5 p.m.
Pre-Hispanic Mayan sculptures and paintings by Diego Rivera, Frida Kahlo, Rufino Tamayo, José Clemente Orozco, Dr. Atl, and prints byJosé Guadalupe Posada, David Alfaro Siqueiros and Pablo O’Higgins. Gary Baseman, P.43, 2008. Colored pencil on antique paper. 15 x 10 in. Artists' Talk Saturday, January 24, 11:30 am. RSVP 202.338.5180 seating is limited to the first 50 people. When Mary Lee Bendolph and Louisiana Bendolph went to Berkeley, California to consider collaborating with Paulson Press in 2005, they were already extending the quiltmaking tradition of the women of Gee's Bend, Alabama to new audiences, in new ways. Joined by fellow Gee's Bend quilter, Loretta Bennett in 2007, these three artists have produced a coherent body of vividly colored, delicately textured etchings that, while moving into a, for them, unfamiliar medium, stand firmly in the design tradition the quilts from the Gee's Bend community have become known for. The bold, asymetrical quilts and prints in this exhibition at Addison/Ripley Fine Art are richly colored, beautiful and compelling, melding the talents of "new" and "old" quilters as they continue in the present day. 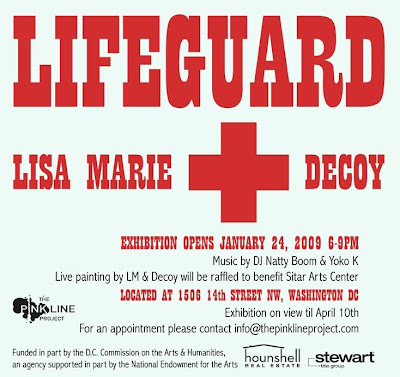 Live painting by Lisa Marie Thalhammer and DECOY will be raffled to benefit Sitar Arts Center. Launched in Spring 2007, Transformer's FlatFile program features a unique variety of two-dimensional, unframed works on paper by a diverse and esteemed roster of artists working in mediums including photography, painting, drawing, and printmaking. All works are approximately 16" x 20" in size and smaller. Paper Trail is presented at both Transformer's project space & Heineman Myers Contemporary Art in Bethesda, MD, highlighting different selections from the current FlatFile, as well as new work by Victor Aguilar, Emily Andrews, April Behnke, Nancy Blum, Alan Brown, Jessica Cebra, Natalie Cheung, Melissa Dickenson, Ryan Hill, Paul Jeffreys, Andy Kozlowski, John Lancaster, Katherine Mann, Nikki Painter, Bondé Prang, Lauren Rice, Bonaia Rosado, Señor Tangcito, Champ Taylor, and Lisa Marie Thalhammer. The majority of works are priced between $75 -$500, with 70% of all proceeds going directly to the artists. Transformer: Wednesday - Saturday, 1-7pm & by appointment. Heineman Myers: Tuesday - Saturday, 1-6pm & by appointment. & HERE Manifest Hope: DC ~ The Art! DFA continues the inauguration celebration with this show featuring 12 paintings from 2005 - 2008, including six from Leah Tinari's recent masquerade series. This is Leah's first solo show at DFA since contributing works to the group show, Hit Me With Music at District Fine Arts in 2007 and again at DFA's recreation of the exhibit at Bloomingdale's, Chevy Chase in 2008. Leah's work is a celebration of life. She strives to make paintings of her life, the people and the world around her. Tinari wants to create a wonderful and vital dialog between people and art, and between art and life. 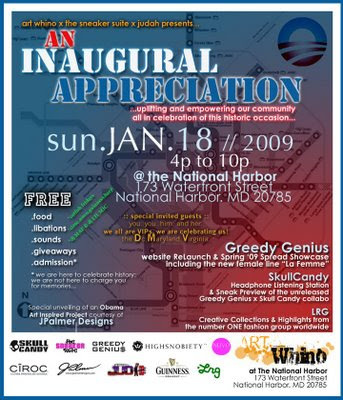 2009 Inaugural Celebration. Washington D.C. National Mall "Satellite image courtesy of GeoEye." See a very cool interactive version of the Satellite image at Washington Post. Those "ants" are you and me in the millions. AM is online with Photos of Smithsonian’s National Portrait Gallery unveiling and inducting Shepard Fairey’s symbolic “Hope” image of Barack Obama. Martin Irvine of the Irvine Contemporary was credited for dedicating the time and effort to make this possible. The next tour of the Wilson Building Art Collection will be Thursday January 29, 2009 at 4:30pm.Attend the first tour of the New Year, featuring a new focus on individual artists and their stories. 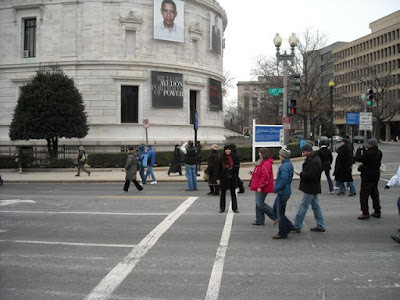 Tours meet in the lobby on the Pennsylvania Avenue side and last approximately 60 minutes. 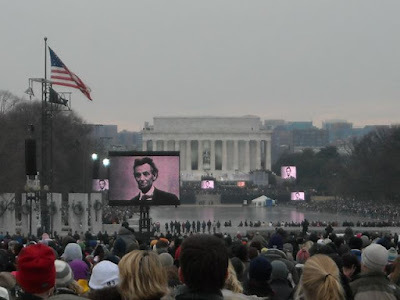 For more information please call 202.724.5613.
as seen from the steps of the Lincoln Memorial......Jumbotron. 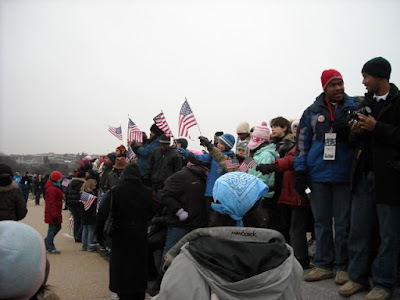 We millions walked to the Lincoln Memorial and down the National Mall to stand with a million other people to hear the swearing in of the President of the United States. 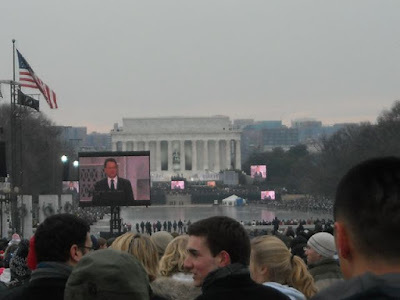 We saw the event from the jumbotron set up at the memorial and on TV when we got home. 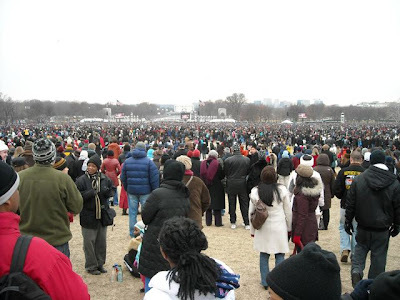 Being among the people and experiencing the joyful crowds will be something to remember for a lifetime. Yo Yo Ma performed John Williams "Air and Simple Gifts," a brilliant arrangement which was performed beautifully. 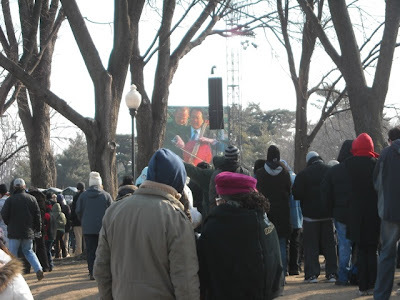 Folks arrived at 4am to stand for hours in the cold to be part of this historic day. 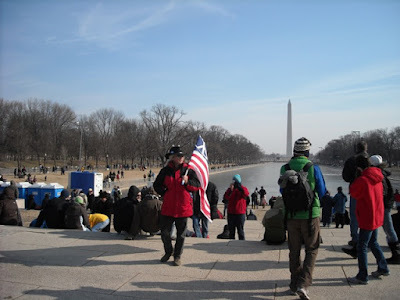 We arrived at the Lincoln Memorial around 10:30am and stayed for three hours before walking to Dupont Circle, stopping for a hot chocolate and watching the presidential parade on TV. The outside temperature dropped 10 degrees in the three hours we were out. If you couldn't get anywhere close to the events, I hope you had the opportunity to watch some of the days festivities on TV. It all matters! Today we were witness to a great moment in history. A picture is worth a thousand words. First Lady Michelle Obama, Vice President Joe Biden, Dr. Jill Biden and all your families! 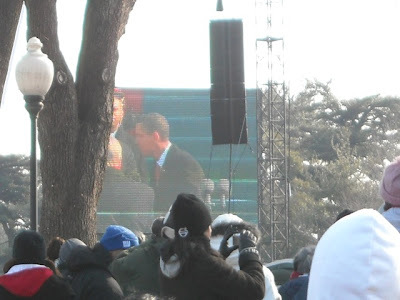 12 p.m.: Barack Obama is sworn in as president by Supreme Court Chief Justice John Roberts. 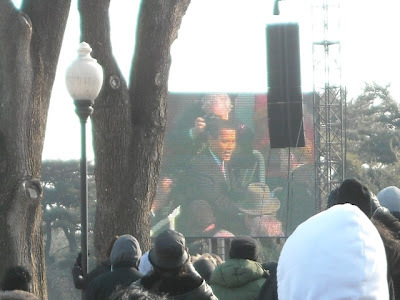 Obama, with his hand on Abraham Lincoln's inaugural Bible, will recite the same oath as his predecessors: "I do solemnly swear (or affirm) that I will faithfully execute the office of president of the United States and will, to the best of my ability, preserve, protect and defend the Constitution of the United States." Musical performance from John Williams, Yo-Yo Ma, Itzhak Perlman, Gabriela Montero and Anthony McGill, followed by "Hail to the Chief" and a 21-gun salute. "Be the Change: Live From the Inaugural" will air live on MTV on Tuesday, January 20, at 10 p.m. ET/PT. 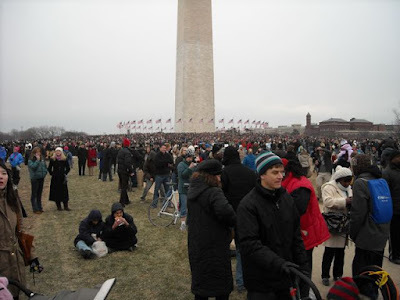 MTV News will have wall-to-wall coverage of the event and of the scenes in Washington, D.C., New Orleans and Kenya in the days leading up to the event and in the days that follow. Barack Obama as President of the United States. 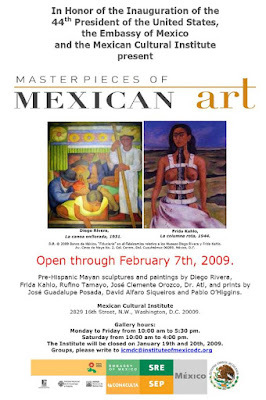 This exhibition continues through January 31st. 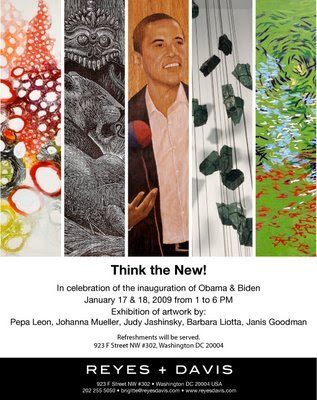 In honor of this historic event, Govinda Gallery will be exhibiting a selection of inaugural and presidential-related work including photographs by Jacques Lowe (JFK and Jaqueline Kennedy), Christopher Makos (The Supreme Court and The Washington Monument), Henry Grossman (Eleanor Roosevelt, JFK), William Coupon (Nixon, Reagan, Bush I, Carter, Clinton, Bush II), Frank Stefanko (Bruce Springsteen), Claude Gassian (U2), Bob McNeely (Bill Clinton), Phil Stern (JFK, Frank Sinatra, Peter Lawford), Jose Figueroa, (Lincoln Memorial) as well as America's great folk artist, Howard Finster (Abraham Lincoln, George and Martha Washington) and The Great Seal. 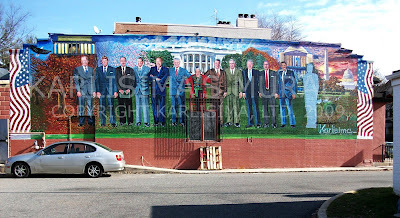 Karlisima has created the first major mural in Washington DC to include President Obama, standing with the 10 most recent presidents of the United States. The mural, beginning with President Dwight Eisenhower in chronological order all the way to Obama, is now on display at 1967 Calvert Street NW, Washington, DC at the Mama Ayesha’s Restaurant. Washington, DC artist Karlisima has created a 60’ x 25’ mural for the community which will educate and delight generations to come. Working nonstop for months, the artist unveiled the presidential mural in January. This historical mural is funded by the D.C. Commission on the Arts and Humanities, the Mama Ayesha’s Restaurant, the ANC (The Adams Morgan Advisory Neighborhood Commission) and Private Sponsors. The mural is being unveiled at President Obama’s Historical Moment: The first African-American President ever elected in the History of the USA. The mural also includes major D.C. landmarks such as the White House, the Lincoln Memorial, Jefferson Memorial, the Capitol and Washington Monument, giving the mural a look of DC's largest postcard on a wall. Creating a mural of this magnitude takes the support of many segments of a community and the dedication and vision of the artist to contribute to and enliven a space for its citizens. The subject matter and theme of this mural are relevant to the times. There's also a surprise element in the mural for the future. You won't want to miss seeing this beautiful new creation to DC's Public Art feasts. 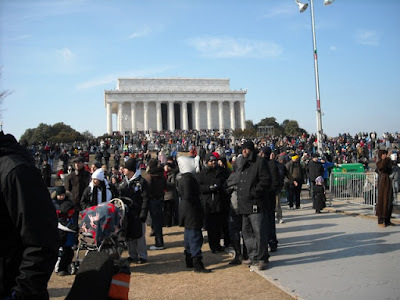 “We Are One: The Obama Inaugural Celebration” at the Lincoln Memorial in Washington DC on Sunday (January 18). 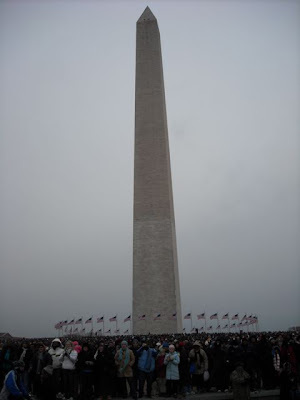 Yesterday I and thousands of other folks walked to the Washington Monument to look across at the Lincoln Memorial where the performers were playing for the We Are One: The Obama Inaugural Celebration; Beyonce, Bruce Springstein, Pete Seeger, James Taylor, Mary J. Blige, Bono, U2, Garth Brooks, Tom Hanks, John Legend, Jennifer Nettles, Bettye Lavette, Samuel L. Jackson, Denzel Washington, Jamie Foxx, Tiger Woods, Jack Black, Usher, Shakira and Stevie Wonder, Queen Latifah, Bettye LaVette, Jon Bon Jovi, Will.I.Am, Sheryl Crow, John Mellencamp were some of the performers. We saw and heard some of the performers on the jumbotrons and experienced the hugh excited crowds. What a sight and a great vibration. We loved walking and walking from Dupont Circle, happy to not be in a car in the traffic in the city. No cars for the next few days and the metro was 1000 deep last night for people trying to get in to catch the trains. Luckily the wind wasn't blowing and 34 degrees felt comfortable, if you were gloved, scarfed and coated with extra leggings. 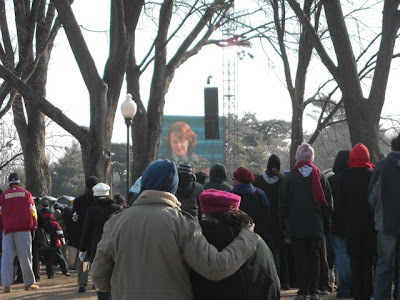 I hope you can feel some of the positive energy from these pictures in Washington, DC. 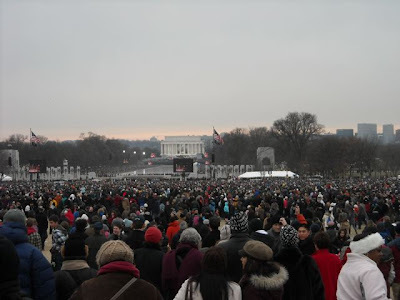 The crowds will get bigger in the next two days! Keep your TVs on for these historic moments. Everyone should realise the impact of astronomy and other fundamental sciences on our daily lives, and understand how scientific knowledge can contribute to a more equitable and peaceful society. 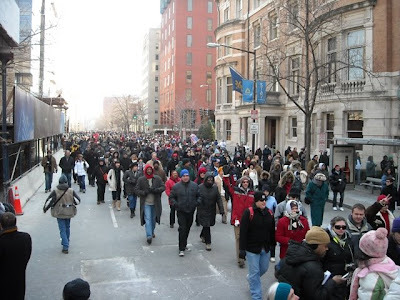 IYA2009 activities will take place locally, nationally, regionally and internationally. National Nodes have been formed in each country to prepare activities for 2009. These nodes will establish collaborations between professional and amateur astronomers, science centres and science communicators to prepare activities for 2009. Already now, 136 countries are involved and well over 140 are expected to participate eventually. 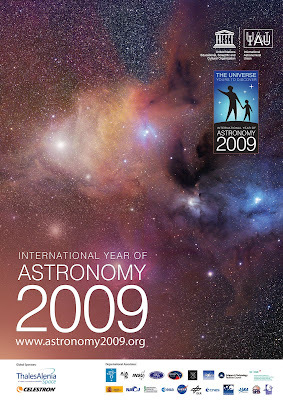 In recognition of the 400th anniversary of Galileo Galilei’s first celestial observations, 2009 has been designated the International Year of Astronomy. To celebrate, NASA’s Great Observatories – the Hubble Space Telescope, Spitzer Space Telescope, and Chandra X-Ray Observatory – are collaborating to produce spectacular multi-wavelength views of our universe. Click to see participating Institutions. Panoramic visuals, cutting-edge technologies and introspective contemplations position 400 Years of the Telescope as the must-see cinematic feature for the International Year of Astronomy in 2009. Check US Website for more information. Opening Reception, Thursday, January 22, 6 - 9 p.m.
Book Signing and Discussion with both photographers: Thursday, March 5, 7 - 9 p.m. This exhibition will showcase the results of this photo exchange, and a book highlighting the work of both photographers will be available for purchase. celebrate history. celebrate life. celebrate each other. the true art of celebration. Art Whino hosts a series of distinctive, strategic events to commemorate change in America and abroad; to memorialize history. FREE** and open to the public. With a blaze of fire and smoke, Etsuko Ichikawa applies a methodically shaped piece of molten glass directly to heavy stock paper. Her large scale "Glass Pyrographs" carry the action of painting, as she works her paper surface from all angles, allowing the molten glass to burn into her medium. Ichikawa's process expresses her continuing investigation of what lies between the ephemeral and the eternal. They are examples of creating something tangible from abstraction; resulting in work that is dynamic, yet subtle, and visually organic. Born and raised in Japan and having lived in the United States for the last decade, Ichikawa recognizes her dual cultures as defining influences and psychology as her primary source of inspiration. 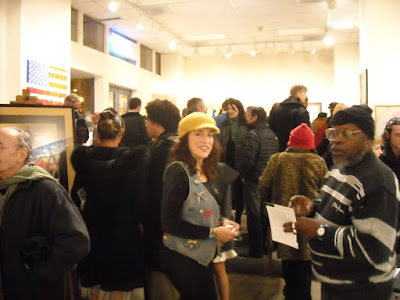 Here are a few photos from the packed Zenith Gallery opening last night. A celebratory evening was had by all!